Lobster traps, buoys, barrels and industrial buildings dot Portland’s Union Wharf, owned by the Poole family for more than two centuries. 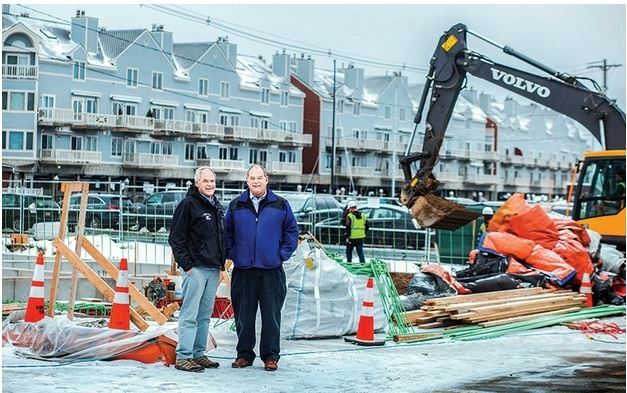 Brothers Charlie and Malcolm Poole lease space to 25 tenants and 15 boats that tie up on the pier, all part of Portland’s prized working waterfront. As they seek new tenants and income sources, the brothers are having a three-story office built at the adjacent Widgery Wharf, which they also own. They’re planning two more buildings of commercial and retail space on Commercial Street in what is to be the first large-scale project under 2010 zoning that allows for more non-marine waterfront land use under certain conditions, including providing money to invest in marine infrastructure.